The birth of a new political party in resource-rich but conflict-torn Balochistan. 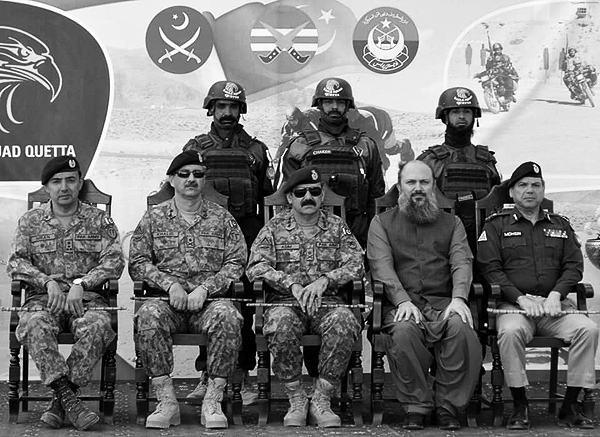 Balochistan Chief Minister Jam Kamal Khan (in civilian dress) at an army function in the Baloch capital of Quetta in October 2018. To his right is General Asim Saleem Bajwa, former head of the Pakistan Army’s media wing, who currently leads the Southern Command in Quetta. At the World Economic Forum in Davos in January 2019, when Balochistan’s Chief Minister Jam Kamal Khan declared that Balochistan was open for business, he was following in a long tradition of politicians hoping to attract capital to the resource-rich yet economically struggling province of Pakistan. Interestingly, in making this pitch to the gathering of the world’s business elites, Khan was accompanied by General Asim Saleem Bajwa, former head of the Pakistan Army’s media wing, who currently leads the Southern Command in the Baloch capital of Quetta. The Davos appearance was the latest among a series of events that marked the political ascendance of Chief Minister Khan, or more accurately, of the Balochistan Awami Party (BAP) which he hails from. Formed amid political turmoil less than a year ago, the BAP is in many ways a new phenomenon in Balochistan. It takes a hitherto untraversed route in the province’s politics – it is neither a regional extension of the national parties nor ideologically committed to Baloch nationalism or Islamist politics. The BAP is the first Balochistan-based federalist party. While some of its political demands – the province’s control over its own resources, for instance – are similar to that of Baloch nationalist parties, it avoids their nationalist rhetoric and couches its agenda in the idiom of development – on the need for economic uplift of Balochistan by improving governance and attracting foreign investment. The cofounder of the BAP, Saeed Ahmed Hashmi, frankly affirms that the party was formed to bring together Baloch leaders opposed to ethnic politics. Notably, the BAP leaders routinely excoriate the nationalist parties for Balochistan’s privations but absolve the military of any wrongdoing in the province, ignoring questions of enforced disappearances, torture and murder of political activists in the region. Over the past year, the party has significantly weakened the hold of regional and national parties that have traditionally been in power in the province. The emergence of BAP is viewed suspiciously by other political parties in the province, particularly the Baloch nationalist parties like Balochistan National Party (BNP-M) and National Party (NP), whose political plank includes demand for an autonomous Balochistan within a federal Pakistan to safeguard the rights of the Baloch population. They see the BAP – sometimes referred to as the ‘king’s party’ – as another tool of the military to marginalise Baloch nationalists and acquire greater control over the politics of the province. Rival political parties and observers in Balochistan have spoken about the uneven playing field created to favour the BAP by mobilisation of state resources during recent elections. For instance, the BAP was allowed to take over a government hospital as campaign office during the July 2018 general elections. Provincial and national parties have also complained about the military coercing their members to switch political allegiances. It is difficult to conclusively establish that the BAP is a front for the military, as alleged by its detractors, for want of concrete evidence. Still, claims of close links with the ‘deep state’ may not be entirely unwarranted. Several politicians behind the formation of the BAP – strongmen instrumental in the making and breaking of many provincial governments in the past – have been noted for their closeness with the military. For a disparate and often squabbling group of lawmakers to work in tandem and pull off these feats in such a limited period is baffling. It is here that critics allude to a powerful ‘hidden force’ guiding a fractious lot. Chief Minister Khan, however, argues that close ties with the military are only natural in a war-like situation that has been fomented by ‘external enemies’. Provincial governments in Balochistan have mostly been formed as coalitions between a regional party and a major party from the centre – such as the Pakistan People’s Party (PPP) or Pakistan Muslim League. Sometimes characterised as a laboratory for the army to manufacture changes in national politics, Baloch politics has been infamous for having many willing partners who can switch allegiances and often act as clients of the political or security establishment. For observers of Balochistan, the birth of the BAP in March 2018 was yet another example of that. In January 2018, 14 of the 65 members of the Balochistan provincial assembly (MPA) submitted a no-confidence motion against Chief Minister Sanaullah Zehri of the Pakistan Muslim League-Nawaz (PML-N), then the ruling party in Islamabad as well. Following this, several PML-N legislators defected to the opposition – a move which some claim was engineered by the military ahead of the Senate elections in March. The chief minister resigned a week later, hours before the scheduled assembly where the no-confidence motion would be tabled. The dissident members successfully supported Abdul Quddus Bizenjo, former deputy speaker of the provincial assembly, to the position of chief minister. Bizenjo’s elevation astonished many considering that his party – the Pakistan Muslim League-Quaid (PML-Q), which supported Pervez Musharraf’s 1999 military coup – had miniscule presence in the Balochistan legislature. Since Balochistan houses the smallest proportion of Pakistan’s population, despite being the largest province geographically, it sends only 16 of the 272 directly elected representatives to Pakistan’s lower house, the National Assembly. The influence that politicians from Balochistan lack in the National Assembly, they make up for in the upper house, the Senate, which maintains parity in the provincial representation with 23 elected from each province, no matter its size or population. For the same reasons, the Senate is also the site of the most intense horse-trading in Pakistan’s politics. With the PML-N out of power, the rebels – composed of PML-Q members, independents and defectors from the PML-N – went on to win six out of the 11 vacated Senate seats from the province. PML-N failed to win a single seat from Balochistan. The new group under Bizenjo also managed to elect a political novice, Sadiq Sanjrani, as chairman of the Senate by securing the support of Pakistan Tehreek-e-Insaf (PTI) and the PPP at the centre. Previously a PML-N member, 39-year-old Sanjrani was the youngest and the first Baloch to rise to that position. Two weeks later, on 29 March 2018, the creation of the Balochistan Awami Party (BAP) was announced, formally bringing together the lawmakers who had managed to suddenly diminish the PML-N’s place in Balochistan politics. By the time provincial elections came in 25 July, BAP was expected to emerge as the largest party in the province. BAP won 15 out of 51 general seats up for grabs – the most by any party – going on to form a coalition government whose partner included Imran Khan’s PTI, the ruling party in Islamabad. All the opposition parties claimed that the elections were rigged in favour of the BAP. So what kind of political change will the creation of a new political force in Balochistan spur? Following the end of Pervez Musharraf’s military rule in 2008, civilian governments in the province have not been able to challenge security agencies like Frontier Corps, a federal paramilitary force, and the Military Intelligence (MI), intelligence arm of the Pakistan Army. Cases of killings and enforced disappearances of Baloch activists, nationalists and their sympathisers have continued to rise. The provincial government’s inability to end this culture of impunity and safeguard human rights has contributed to Baloch disillusionment with the democratic process. There is nothing to suggest that the BAP would change this status quo by confronting the deep state. It has instead chosen to stay away from issues likely to irk the military. It has neither shown any inclination to negotiate with Baloch insurgents nor offered any policy to resolve the issue of missing persons. With regards to the China-Pakistan Economic Corridor (CPEC) – which aims to connect Gwadar Port in Balochistan to Kashgar in the Xinjiang region of China through a network of pipelines, highways and railways – BAP has given mixed signals. Like several other Baloch leaders, Chief Minister Jam Kamal Khan has decried the province’s dismal share in the development projects under CPEC, which is estimated to cost USD 60 billion. Khan has announced that no ownership rights over Balochistan’s land will be granted to any private company. Instead, land will only be leased out. However, on one of the most fundamental questions regarding CPEC – the lopsided revenue sharing system of infrastructure projects like the Gwadar Port – the BAP has not made any serious attempts to allay the concerns of the Baloch people. According to the build-operate-transfer (BOT) agreement that grants leasing rights of the port to China for the next 40 years, China Overseas Port Holding Company would get 91 percent of the profits for the period. The federal government would receive the remaining nine percent, depriving the host province of any revenue. The proposed Gwadar Port City is also expected to attract millions of economic migrants in the province, and the fear of demographic change is resented by many in Balochistan. Discontent over the port was instrumental in engendering nationalist militancy in areas like the Makran division. The BAP’s mixed stance on CPEC notwithstanding, it is difficult to conceive how it plans to bring long term political and economic stability without confronting some of the fundamental questions that drive Baloch nationalist resistance. PTI – the ruling national party and BAP’s coalition partner – likewise lacks a coherent policy to deal with Balochistan’s myriad problems. Prime Minister Imran Khan has only made desultory references to Balochistan, underlining its chronic under-development. He has also made assurances on the recovery of missing persons from the province, although this was not an outcome of the BAP’s bidding. Rather, it stemmed from the provincial opposition BNP-M’s engagement with the PTI, which culminated in a six-point pact in August 2018. The two parties agreed on resolving the issue of missing persons in Balochistan, renegotiating the province’s share of ownership of its natural resources, and the repatriation of Afghan refugees. In exchange, the BNP-M offered the support of four of its members of the National Assembly to the PTI. With this, the centre has succeeded in recruiting the support of both the ruling and opposition party in Balochistan, and further weakened the two traditionally dominant parties of Pakistani politics – the PPP and the PML-N – in Balochistan. Yet the distinction between those who govern Balochistan and those who stand in opposition might not last too long. The BAP is a hastily cobbled political party comprising of individuals whose actions and allegiances are determined by the considerations of power rather than a coherent ideology or a support base. Recent reports suggest of internal conflict brewing within the young party, and the possibility that its disgruntled provincial assembly members might forge coalition with the BNP-M, which has been out of power since 1998. Defections to the ruling national party is yet another possibility. Between this tenuous political arrangement of the present and a fractious future, only the powerful presence of the deep state seems to be a constant in Balochistan. Meanwhile, hopes of vibrant democratic exercise in Balochistan appear as distant as ever. ~ Shakoor Ahmad Wani has recently submitted his PhD to the Centre for South Asian Studies, School of International Studies, Jawaharlal Nehru University (JNU), New Delhi. He tweets at @shakoor865. Sarah Eleazar and Sher Ali Khan on how a civil-rights movement is challenging Pakistan’s status quo. A podcast interview with senior journalist Beena Sarwar on 2018 general elections in Pakistan. On the difficulties and implications of trying a military ruler in Pakistan.